Steaming out of Alexandra Fjord after another successful mooring recovery, we are heading south to service two automated weather stations at the southern entrance to Nares Strait. 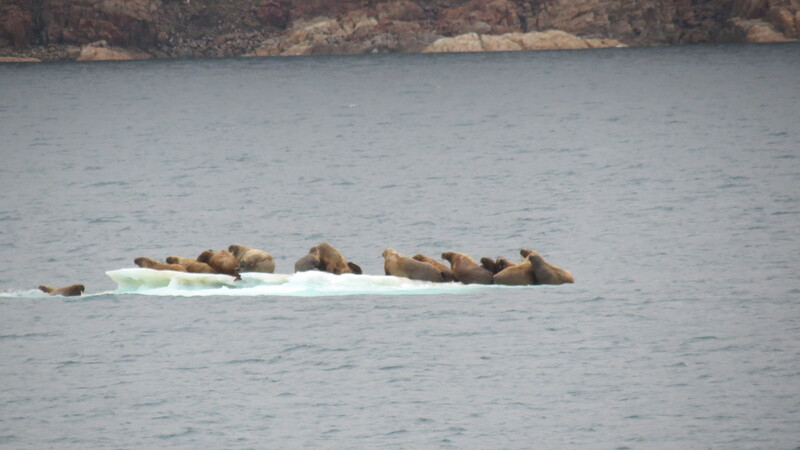 During the last 3 days we have seen schools of narwhales in Petermann Fjord, a polar bear on an ice floe in Kennedy Channel just off Hans Island, and now several schools of walrus in Alexandra Fjord. I do not recall this much wild life during prior trips to Nares Strait. Most wildlife is first seen on the bridge of the CCGS Henry Larsen. An announcement is usually made via the ship’s loudspeakers that often pipe music or the report of the day. It is a funny sight to see 10 scientists and 10-20 crew scrambles for cameras and a good viewing position. The officer in charge aboard the bridge is also in charge of the ship’s camera whose pictures are placed on a public computer for all aboard to access. I also placed several videos from Petermann Fjord and glacier on the same public access point. It is remarkable how freely everyone aboard shares photos, videos, as well as data, experiences, and skills. It makes for a most pleasant atmosphere working and living together for the 2-3 weeks we scientists are aboard. 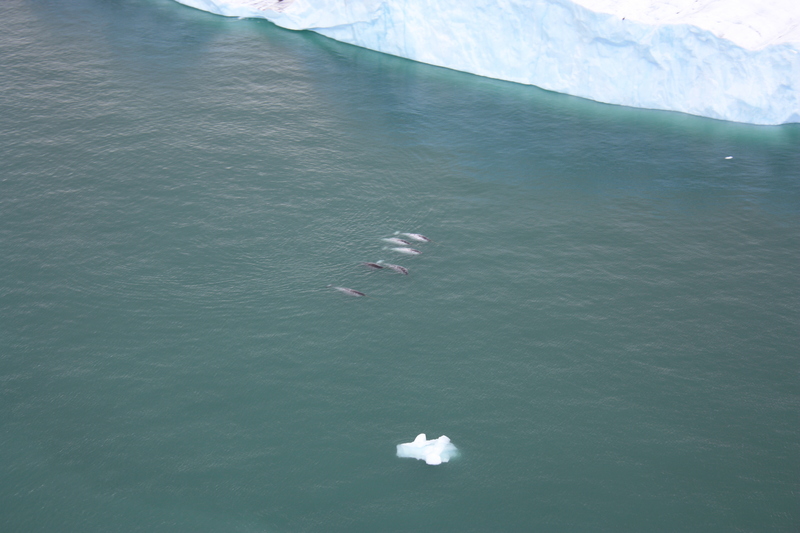 As for the narwhales of Petermann Fjord, our sadly absent colleague Dr. Helen Johnson of the University of Oxford was the first person to ever report these bottom-feeding mammals deep inside Petermann Fjord from a helicopter flight in 2009. She also conducted the zodiac survey along the edge of the floating glacier that broke off in 2010 and some more in 2012. Narwhales have been observed to dive down to over 1000 meters depth to feed via tiny pressure and temperature profilers attached their thick skins. The data were transmitted via satellite when the whales surfaced for breathing. 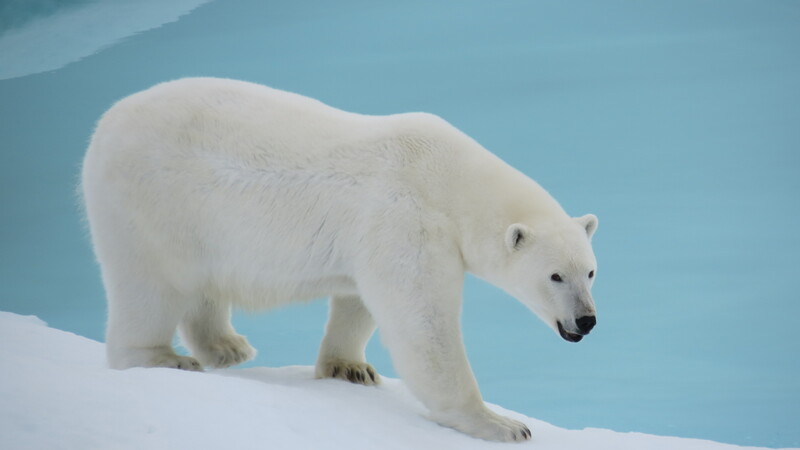 The polar bear knows no fear and approaches every moving object, including a red icebreaker without fear, but lots of curiosity and investigates. Our polar bear perhaps thought that the big red moving ship was a wounded, blood-soaked food item. Everything is food for polar bears; some have been successful to tear down automated weather stations. Two polar bears were sighted from the ship’s helicopter today while landing a party of three to install a new weather station with an Iridium link for real-time data display. Everyone tried to finish the job as quickly as possible to get off the small island without encountering the bears. Which brings me to the last item of this post: I have been struggling for 2 days with “nibbles” while trying to extract information on how battery voltage changed over time on some of our moorings in order to track down and diagnose a potential malfunction in one of our instruments. And the problem was that some information within a he binary data stream was separated by nibbles. It is a beautiful new word that I learnt 2 days ago from our Chief Scientist Dr. Humfrey Melling. Lots of the many data streams we are dealing with from our moored instruments, our survey instruments, our weather stations, our e-mails, etc., etc. are digital data that are stored as binary (composed of “0” and “1”) or hexadecimal numbers (composed of 1,2,3,4,5,6,7,8,9,A,B,C,D,E,F) where our decimal number 255, for example is coded as 11111111 in binary or FF in hexadecimal. The number 255 is represented as 8 bits, which equals 1 byte, which equals 2 nibbles. So a “nibble” is half a byte and the F of a hexadecimal number represents the information content of 1 nibble. To get my voltage recordings, I had to separate a single byte into its two nibbles to allocate one (along with another byte) battery voltage while the other was allocated to a second independent battery voltage. If this sounds “geek,” it is. In order to watch the narwhales, walrus, and polar bears for a short moment of being an intermittent tourist, more advanced skills and a wicked sense of humor and hard work are absolutely essential to be a scientist a research expedition such as the one we are about to conclude. We just finished our last CTD cast at 1:30 am local time to measure temperatures and salinities within one nautical mile off Greenland near 78.5 North and 72.5 West. Rain turned to snow … winter is upon us at 2am on Aug.-14 already. Addendum: Added photos on Sept.-13, 2012. This entry was posted in Nares Strait 2012, Polar Exploration, Wild Life and tagged Nares Strait, narwhales, nibbles, polar bears, walrus. Bookmark the permalink. The weather stations at Hans Island and Littleton Islands are online and transmitting at http://dalriada.sams.ac.uk/ while the new weather station at Joe Island (southern entrance to Petermann Fjord) and Brevoort Island (Ellesmere Island south of Alexandra Fjord) will go online as soon as my Canadian collegues get home early next week. Between the nibblers and the piddlers the show must go on. Sounds like your skreech wasn’t squandered in ransom payments, and if i recall correctly there is a huge kharmic penalty for coming ashore with an undrained bottle. Wonderful posts, Andreas. You are giving my non-scientist self a small and interesting window into many of the aspects involved in conducting your research and also a vivid mental picture of the sights. Thank you.